Leadscon 08 Was Awesome – Well Done Jay! I have spent the past couple days in Las Vegas at Leadscon 08. This is the first conference that separated lead generation from the affiliate marketing space. Some people don’t really think there is much of a difference between lead generation and affiliate marketing, and others say it’s about time that someone gave lead gen its own conference. After two days of sessions, networking and learning, I can tell you first hand that Jay Weintraub’s Leadscon conference was a smashing success. I arrived Wednesday morning and immediately went to work distributing the last of the Top Affiliate Challenge t-shirts to attendees (Leadscon put a Top Affiliate Challenge piece in their tote bag for us). With that bit of work out of the way, I hit a couple sessions to get a feel for how the conference was going to unfold. Shortly thereafter I cruised the exhibition hall and talked to a bunch of companies that had some pretty innovative products. 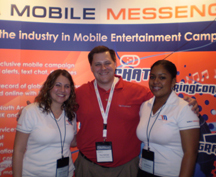 One of the first booths I hit was the Mobile Messenger booth. They had some pretty cool technology that allows you to outsource the delivery of subscription content to mobile devices. If you want to start your own subscription service like horoscopes, jokes, ring tones or the like, Mobile Messenger sets up a $10/month revenue share between you, the mobile carrier, and Mobile Messenger. Lets just say that started my idea factory rolling! The NeoHire booth looked like fun, even though I had no idea what they did. I introduced my self and learned that they are a professional headhunting service. If you want to hire a big-wig from another company to work for you, you tell these guys who you want and they go get it. The guys in the booth were very interested in Top Affiliate Challenge and it would be awesome to find a way to work them into the show. I have the feeling we will be talking with them again soon. Then I came across a booth that said they were an alternative to Yahoo and Google. Any alternatives to the Google monster always interest me, so I stopped to learn more. Reply.com is an alternative to Google Adwords. Rather than buying clicks on your ads, you buy qualified leads from them. The leads are vetted to ensure they are legit and then the marketplace determines the value of the lead through a real-time bidding process. 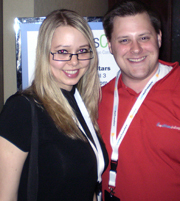 As I mingled about, I spotted a familiar face from Affiliate Summit West 08. Jessica Parnell from CXdigital was carrying one of the cool bags they gave away at the Summit (which my wife is STILL kicking herself for not getting while she was at ASW – send me another one :-p). I stopped her to say hi and she asked about Top Affiliate Challenge. I told her some of the companies we had on board as sponsors and some other s that we are closing on this month. At this time we still have a team sponsorship available, so I encouraged her to snap it up. She seemed pretty interested so I got some follow up work to get done when I get home. Of all the websites that were discussed in the sessions, I was most impressed with www.mint.com. Mint.com is a personal finance website that allows you to track all of your different bank accounts, credit card accounts, 401K accounts, and more from one interface. This is an awesome idea, as long as you are not a conspiracy theorist about having everything in one place. Looks like a good time there. Someday I will get to go to these things. Until then, thanks for the update! Wow Thori just saw this article now. I was actually lucky enough to be present at Leadscon 08 and tbh it was lovely!